I created the name "Mashed Potaga" since it's a combination of potato and rutabaga. Mashing rutabaga is nothing new. Since rutabaga is not a starchy root vegetable, straight up mashed rutabaga isn't as comforting and creamy as mashed potatoes. By adding just a little potato to mostly rutabaga, the texture becomes comparable and even better because of the distinct, indescribable, good flavor. Mom loves this recipe! In comparison to mashed potatoes, Mashed Potaga's have less than half the carbohydrates and less than half the calories. And, by making it yourself, you control how much salt is added. This recipe has half the sodium found in typical mashed potatoes. This recipe is another example of healthy cooking on a budget. The approximate cost per person is less than 50 cents. Enjoy! 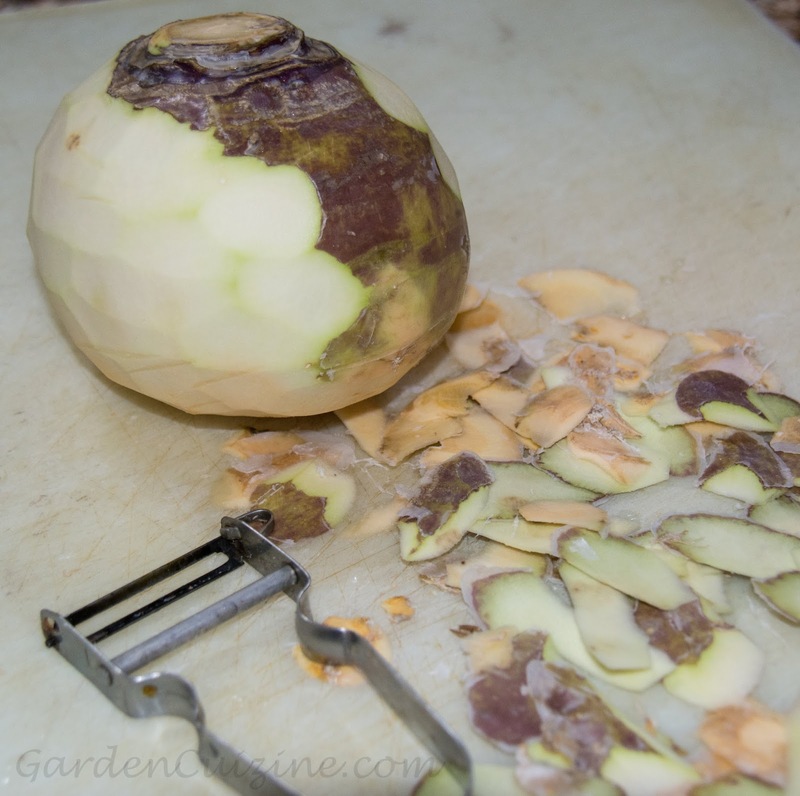 Wash, peel and cut rutabaga into small chunks. Place in stockpot, cover with water and bring to boil. Cover and simmer 25 minutes or longer depending on how big you chopped the rutabaga. 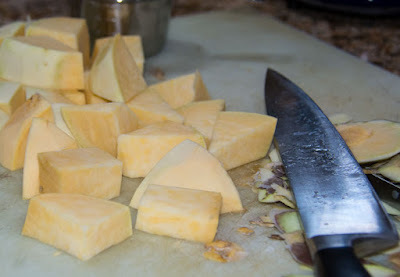 When rutabaga chunks are getting soft, peel and chop the potato into chunks. Add to the same pot. Cook until both potatoes and rutabaga are fully cooked and ready to mash. Remove the well cooked root vegetables with a slotted spoon. Mash using a ricer or food mill into a bowl. Use a potato masher to mix in the remaining ingredients. Taste and adjust seasoning as desired. Place in covered serving dish. Can be made in advance and stored for several days in the refrigerator. Reheat in microwave or oven just before serving. Photos, Mashed Potaga comparison chart and recipe Copyright (C)Wind. *Mashed Potaga is a name created by GardenCuizine. All rights reserved.